Ladies and gentleman, it has arrived. The first unit of the Wrangler-based Jeep Gladiator pickup was filmed rolling off the assembly line an hour ago. 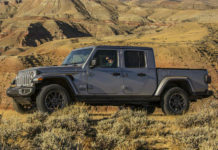 The first-ever 2020 Jeep Gladiator truck was a Rubicon version painted in what appears to be Billet Silver metallic. It’s the first of what will surely be a ton of units to drive off the Toledo plant’s assembly line as the Gladiator figures to be one of the most popular models in the industry this year. 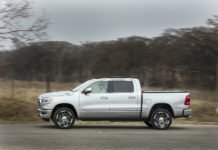 Powered by a 3.6-liter Pentastar V6 engine, the new Gladiator which was unveiled at last year’s Los Angeles Auto Show promises the best towing capacity in its segment for a traditional gas engine. It will be capable of towing 7,650 pounds with a payload capacity of 1,600 pounds which is best-in-class as well. The Gladiator just edges out the Ford Ranger which can tow 7,500 pounds. The new Gladiator pickup will be offered in basically the same trims as its Jeep Wrangler brother including Sport, Sport S, and Rubicon. Every version will have four doors. An upcoming EcoDiesel 3.0-liter will join the lineup, but that will have to wait until next year. Although Jeep is apparently already building the Gladiator, don’t expect to see it until early this summer. Pricing is yet to be announced, but we expect a premium over the current four-door 2019 Wrangler Unlimited which starts at $41,495 in Canada. For those of you south of the border, that’s equivalent to the $38k four-door Sahara. Ish. 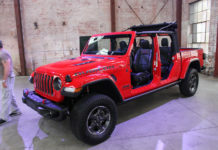 We’re thinking Jeep will price the Gladiator at about $5,000 more than a Wrangler with identical equipment. Given how desirable the Gladiator will be in its first year, excess demand over supply will likely push the price up even further. 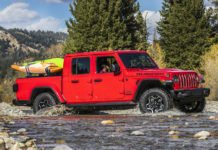 Still, when it comes to cool vehicles, we don’t think you can do better than a 2020 Jeep Gladiator in this price range.